On one hand, there are a lot of false claims made against Windows 10 7 False Claims About Windows 10 and the Truths Revealed 7 False Claims About Windows 10 and the Truths Revealed Are you confused about Windows 10? Many rumors and myths are going around and it's hard to tell between what's real and what's not. We have debunked false claims once and for all. Read More . It’s really not that bad. 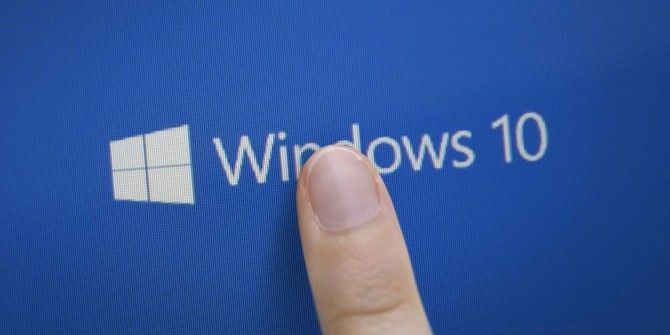 On the other hand, there are legitimate reasons to dislike Windows 10 5 Reasons Why Windows 10 Might Make You Switch to Linux 5 Reasons Why Windows 10 Might Make You Switch to Linux Despite Windows 10's huge takeup, there has been plenty of criticism for Microsoft's new everlasting operating system. Here are five top reasons why Windows 10 might irk you enough to make the switch to Linux. Read More , such as forced system updates Pros & Cons of Forced Updates in Windows 10 Pros & Cons of Forced Updates in Windows 10 Updates will change in Windows 10. Right now you can pick and choose. Windows 10, however, will force updates onto you. It has advantages, like improved security, but it can also go wrong. What's more... Read More and annoying notifications How to Close the Windows Feedback Notification for Good How to Close the Windows Feedback Notification for Good If Windows keeps asking you for feedback, there's a quick and easy to disable it once and for all. Read More . Indeed, Windows 10 upgrade notifications are starting to get really aggressive. If you’re still on Windows 7 or Windows 8.1, Microsoft seriously wants you to upgrade — so much so that declining these notifications is getting harder and harder. Consider the latest nag screen, which is frustratingly deceptive. It looks like you have no choice but to upgrade, right? But instead of upgrading now or upgrading later, there’s a tricky third option: clicking the X at the top right! While that might work for now, it’s possible that Microsoft will make it even harder to decline in the future, so stay wary. The good news is that hope still remains. If you’re willing to put in a bit of effort, you can effectively block these aggressive upgrade notifications How to Block the Aggressive Windows 10 Upgrade on Windows 7 and 8.1 How to Block the Aggressive Windows 10 Upgrade on Windows 7 and 8.1 Microsoft ramps up its efforts to make users upgrade to Windows 10. Come 2016, many people will wake up to a new operating system, despite never having consented to the upgrade. Don't be one of... Read More with a combination of changed settings, registry tweaks, and third-party tools. Are you still on Windows 7 or Windows 8.1? How bad are the nag screens for you? Is this enough to push you towards Linux? Tell us about it in the comments below! Explore more about: Notification, Windows 7, Windows 8.1, Windows Upgrade. The only reason I've not yet switched over to Linux is, basically, the programs and peripherals I use (and which work so well for me) which are not available on Linux. Because of this it's going to be time-consuming and expensive to switch over - but Windows 10 has finally made it worthwhile. No more Windows - and I'm glad to see the back of it. When it first came in I was paid by a company (large oil firm) to look at it and say whether or not it was a Good Idea; my answer then was 'No - more problems than benefits' and, with a couple of blip exceptions (XP, NT, and (sort of) 7), that's mainly always been the case. I'm (almost) sure that it's not Bill Gates' vision that is to blame, just the execution and market forces etc. - but the lack of coherence, the undermining of perfectly good programs (and an originally perfectly good, non-Microsoft OS) plus the continual contempt for users in the real world has made Windows a sorry saga and one I'm going to be heartily glad to leave. I am running Win7 Home Premium,and I used the suggestions in an earlier makeuseof article for those who were being pestered by MS to upgrade,and so far,it works for me.I have the Get Win10 icon in my tool tray,but that is all. Linux may be behind in some features, but if it works and does what I want instead of what MS wants. I'll take it. I have used Linux before, and it has come a long way in the last few years. There are still some programs that will only run on Windows, but fewer every year. MS has traded usefulness for user friendly that isn't really all that friendly. You do what they want you to do in the way they want you to do it using the 'apps' they what you to use. And who cares what you really wanted to do anyway. One cannot be updated - Windows says so. It says the CPU is not compatible - does that mean they won't nag ? NOPE. Even though that computer cannot even run Win10 they still pop up their annoying nags several times a day. The second updated, and I thought it was going to work Then I tried to use the DVD drive. I put a disk for a program I wanted to install - Some obscure Legitimate program called Windows Office Home and Student version that I paid for. And it would not start. So, it hit the eject - and it would not eject. I searched the Windows help and they suggested restarting and going into BIOS and ejecting - that worked. The But Win10 somehow would not eject a DVD. I rolled back to the Win7 x64 Home premium. And the DVD still wouldn't eject. I had to use a The Disk that came with the computer that had the original OEM drivers to get it working. Put the disk in and it ran properly. Installed the program, and would not eject. Rebooted and suddenly the DVD would eject properly. I'm sure that Windows believes their new do all be all for everyone OS is wonderful - But I think it stinks. I have been using Windows since the original release and been happy with most versions. no more. I will be using my Win7 for as long as I can get away with it - then if possible will be switching to Linux where they don't force a square peg into a round hole for their own convenience. I PAID for Win7. I want what I paid for. Not what MS demands that I have. If it's free and it doesn't work its worthless. Absolutely, bben! I agree with your last paragraph in every respect. I haven't tried installing Windows 10 (and won't because, with Windows 8.1 and 8.2 which I've had to use, I'd already decided that there was going to be no more Windows for me), but from friends' experiences your own horrible run-ins seem to be par for the course (and unforgivable). I've always hoped that another OS might come out of the woodwork in time to prevent my having to upgrade to the next Windows, but now I've given up hope. Linus it is. Just by getting some notifications, it does not make anyone to move to Linux... having in mind that many user "friendly" distros are still N years behind windows. In what ways do you feel Linux is behind? In many ways, from applications for system admins to other apps, compatibility is always a pain in Linux. It is also very buggy still. I am trying different Linux/Unix distros from 2008 till now. After 7 years of trying different distros you cannot come up with even one specific example??? I agree. Linux is still a POS on desktop.